How can I use my iPod as a hard drive? 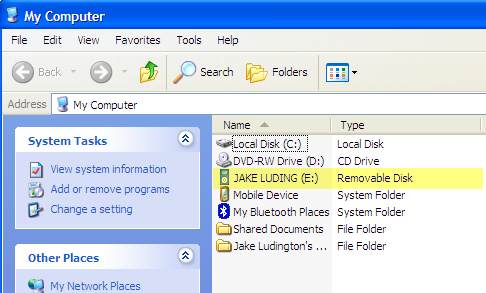 I want to transfer some Word files from my work computer to my home computer. Someone told me my iPod will work to do this. Windows recognizes iPods and most other portable media players as hard drives when plugged in using the USB cable. Any of the player's available memory may be used for transporting files like Word documents, Excel spreadsheets, PDFs and virtually any other file type you wouldn't ever listen to or watch on a portable player. To use your iPod as a hard drive, first connect it to your computer using the sync cable. Open Windows Explorer and expand My Computer (Start > My Computer or Windows Key+E). You should see your iPod in the list of available drives. Double click the iPod icon to expand the folders in your iPod. Either copy files into the root directory of your iPod or create a folder in the iPod directory structure to store your transported files. If you want to quickly add a bunch of contacts or calendar items to your iPod, you can bypass the iTunes interface and use Windows Explorer to copy VCard files into the Contacts folder and .ics files into the Calendar folder. Note: In general, you should avoid putting any files in the folder labeled iPod_Control, because that folder contains music and video files and information required for the iPod to read music and video files correctly.